Obviously, a burglar alarm provides your business with protection against intruders but it can also provide you with insight on how your own staff are using the system and potentially highlight any issues, whether they be genuine user mistakes or something more deliberate. Alarms are quite clever bits of kit and can provide a wealth of information that allows you to assess how it’s being used. Depending on the exact system you have, it can keep a log that is stored for 30 days. This log records both the ‘when’ and the ‘who’; it can tell you the time and date of each occasion the alarm has been set and unset and it also informs you who did it based on the individual fob or alarm code. If you suspect that an employee is entering the premises when they shouldn’t be this would give you a definitive answer. If you have a monitored alarm you can set up an open or close overdue notification. You will then be informed by e-mail if the alarm has not been set or unset at a designated time. This can be useful if your business has regular trading hours, such as a shop, and you need to know that it has been opened and closed at specific times. 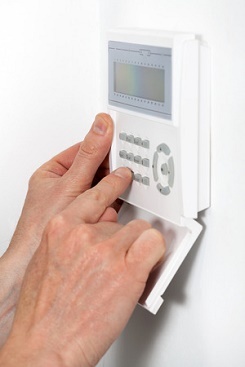 It can show you if it’s been opened late or closed early or if the alarm is not being used correctly. If the alarm is triggered but reset within 90 seconds, indicating a user error, it wouldn’t go through to the monitoring centre but it would still record the information in the log; highlighting that a staff member may require some additional training. It would also tell you which sensor or door contact triggered the alarm which allows you to form a picture of how and where the alarm was triggered. All this data can potentially help you identify if your staff are posing a risk to your business, either through errors in operation or malicious intent. But it can also protect them; providing evidence of when they were in or out of the premises or that the system was indeed set correctly. If you need to retrieve the data from your system, even if it’s not one of ours, then this is something that we can usually do. We can also set up monitoring or add extra items such as speech diallers that provide additional security features. Just call on 01924 371941 or contact us via our enquiry form.